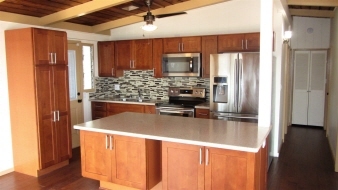 Top to bottom remodel including all new Kitchen, bathrooms, flooring, air conditioners, electrical and plumbing. Ocean views from living areas and two of the bedrooms. ¾ enclosed patio can easily double as dining or entertainment area. There are two 160 sqft, frame on slab, utility sheds large enough for most storage or hobby needs. New retaining walls allow full use of the 6004 sqft lot. Tented in 2016 with transferrable warranty. Roof newly conditioned with premium silicone roof coating. You have to visit to appreciate the new home feel. It is a one of a kind turn-key ready to go home.